The chairman of Magen David Adom UK has heaped warm praise on the organisation’s late vice-president Eli Benson, who passed away in September. To warm applause at MDA UK’s annual dinner on Monday, David Curtis said: “Many of you have already remarked to me that it is with great sadness Eli Benson is not here. I want to say thank you to Eli, but he’s not here, however his family is. Mr Curtis also presented a Points of Light Award from Theresa May – “our current prime minister,” he quipped – to Norman Rosenbaum. “Norman, over his life has done an enormous amount for this organisation,” said Mr Curtis. MDA UK said it was its largest-ever annual dinner with 414 people in attendance. The organisation added that over £550,000 was raised on the night taking the annual dinner campaign to £2.6 million. 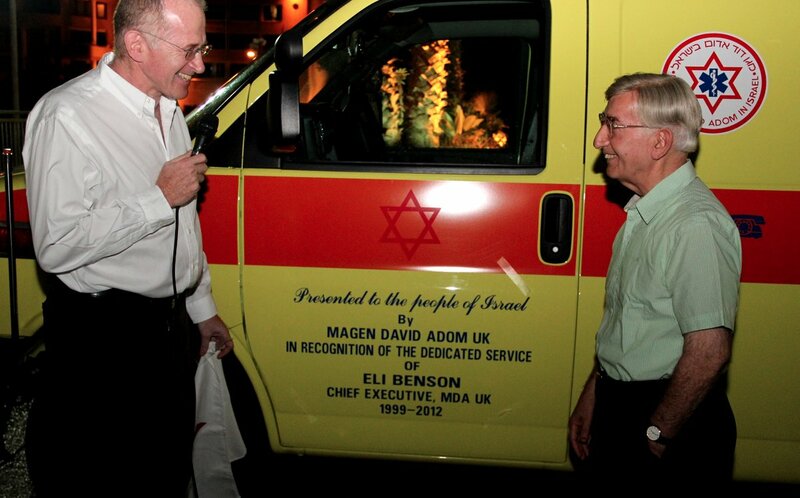 “We have now reached our target of 70 for 70 with 70 new medicycles on the roads of Israel,” it said. Israelis, he added, are healthier than ever before, and the country is a world-leader in pharmaceuticals, “and this is due, in no small part to a group of volunteers who met in Tel Aviv 80 years ago and set up the first MDA station”. The event was compered by TV Judge Robert Rinder, who was seen in several promotional videos at MDA’s station in Eilat.